The house (on the left) opens out to a timber deck (4.0x4.5 m) that serves as the main seating area. A timber step down from the deck leads to a path consisting of pavers (0.6x0.6 m) set in pebbles or gravel. The focal point here is a water feature (1.3x1.8 m) with raised railway sleeper edges. The line of view from the deck to the water feature is reinforced by in-ground railway sleepers. On the other side, the step leads into the garden in such a way that the door is central to the longest axis of the lawn. 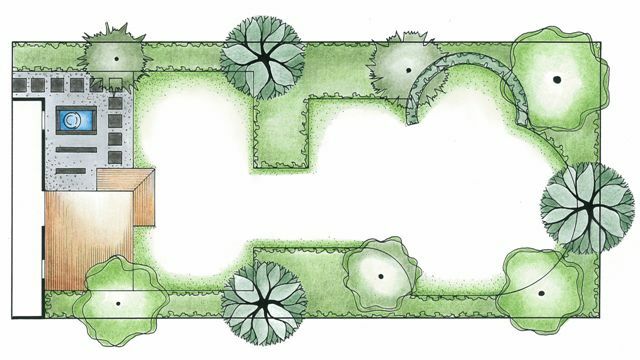 The section is loosely divided into two areas; one smaller area surrounding the deck and a small lawn, and a larger one further away from the house. 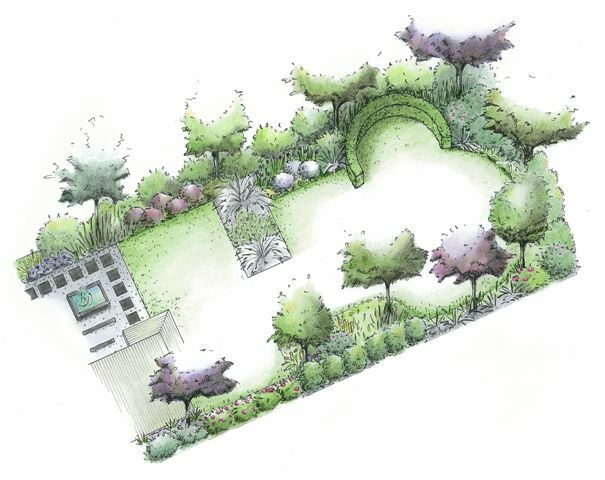 The larger area contains a semi-circular space, partially surrounded by a clipped hedge, that could be used as an additional seating area.